YoungGiftedandFat author, Sharrell Luckett, outlines the journey towards self-love through the sharing of narratives that are at once specific and universal. A book sale and signing will follow the lecture. This program is sponsored by the Clarke Forum for Contemporary Issues and co-sponsored by the Churchill Fund. This event is also part of the Clarke Forum’s Leadership in an Age of Uncertainty Series. Love Your Body Week events are co-sponsored by Clarke Forum; Women’s and Gender Resource Center; Office of LGBTQ Services, Student Life and Campus Engagement; Wellness Center; PALS; Psi Chi; Psych Club; Center for Service, Spirituality and Social Justice; Access and Disability Services; Departments of Theatre & Dance; Psychology; and Women’s, Gender and Sexuality Studies; Creative Writing and the Waidner-Spahr Library. 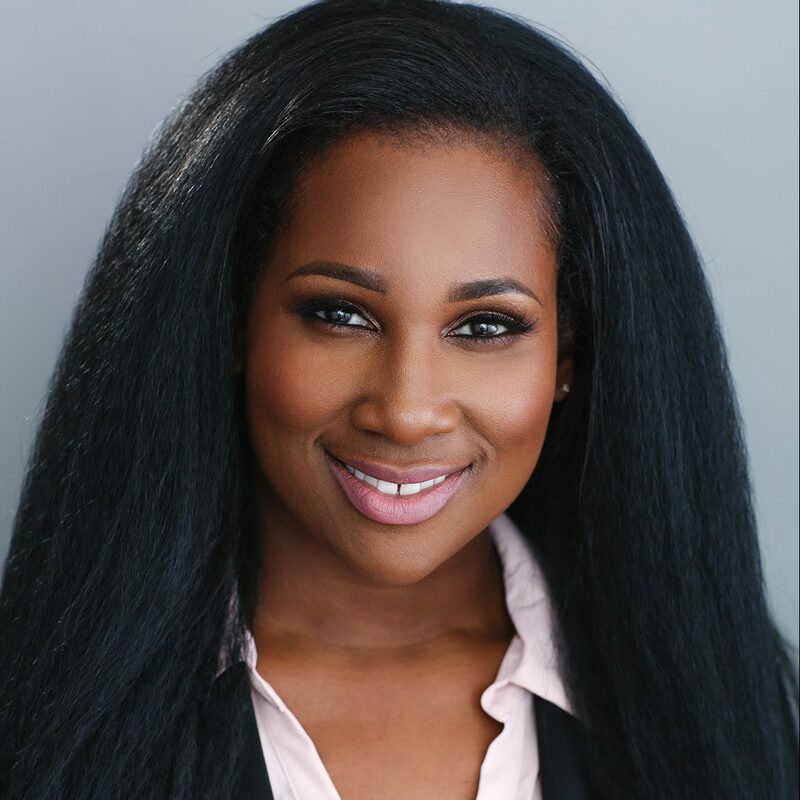 Sharrell D. Luckett, Ph.D. is director of the Helen Weinberger Center for Drama and Playwriting and assistant professor of drama and performance studies in the Department of English and Comparative Literature at the University of Cincinnati. She is also affiliate faculty in the women’s, gender, and sexuality studies program, in addition to faculty collaborator with the College-Conservatory of Cincinnati. 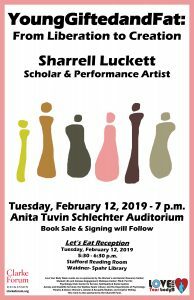 Luckett is the author of YoungGiftedandFat: An Autoethnography of Size, Sexuality, and Privilege, and co-editor of Black Acting Methods: Critical Approaches, an award-winning book that highlights performance theory rooted in black American cultural aesthetics. Her upcoming book projects engage with the work of Tarell Alvin McCraney, the Freddie Hendricks Youth Ensemble of Atlanta, and transweight celebrity performance. 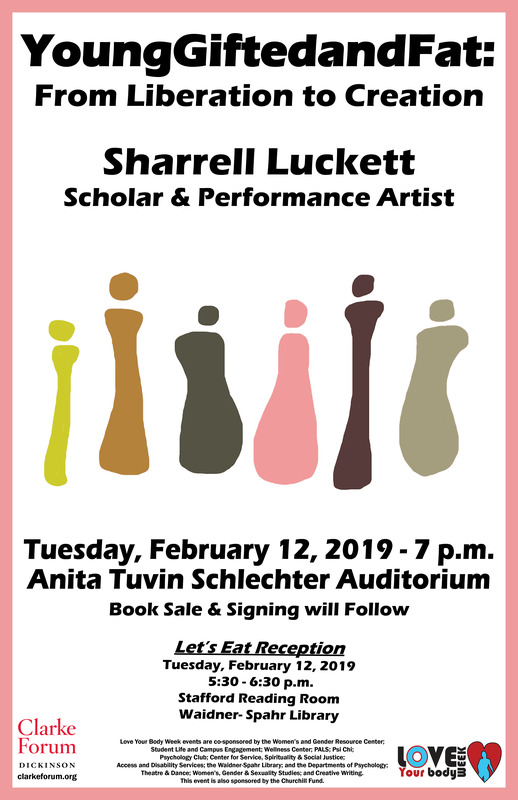 Luckett is a proud invitee of Harvard University’s Mellon Institute of Theater and Performance Research, Cornell University’s Performance Encounters series, Northwestern University’s Mellon Program in Black Feminist Performance, and the esteemed Lincoln Center Directors Lab in NY.